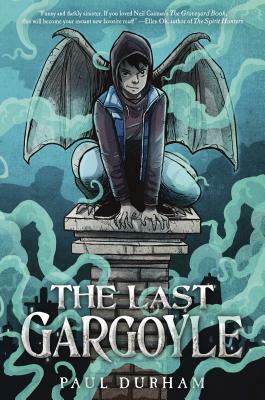 The Last Gargoyle (Hardcover) | Water Street Bookstore, Inc. Fans of Jonathan Auxier's The Night Gardener and Neil Gaiman's The Graveyard Book will tremble with delight for this haunting tale about a lonely gargoyle who isn't alone at all. Penhallow is the last of his kind. The stone gargoyle--he'd prefer you call him a grotesque--fearlessly protects his Boston building from the spirits who haunt the night. But even he is outmatched when Hetty, his newest ward, nearly falls victim to the Boneless King, the ruler of the underworld. Then there's Viola, the mysterious girl who keeps turning up at the most unlikely times. In a world where nightmares come to life, Viola could be just the ally Penhallow needs. But can he trust her when every shadow hides another secret? Can he afford not to? Paul Durham was raised in Massachusetts and went to college and law school in Boston--a city with a shortage of gargoyles even back then. His debut novel, The Luck Uglies, earned the Cybils Award for Middle Grade Speculative Fiction and was named an ALA-ALSC Notable Children's Book, a New York Public Library 100 Titles for Reading and Sharing selection, and a Kansas City Star Best Book of the Year. Paul lives in New Hampshire with his wife, two daughters, and an enormous, bushy creature the local animal shelter identified as a cat. He can be found writing in an abandoned chicken coop at the edge of a swamp, online at pauldurhambooks.com, or on Facebook, Instagram, and Twitter at @pauldurhambooks. You can also listen to him tell fibs on his iTunes podcast, Telling Lies to Children. A Winter 2017-18 Kids' Indie Next List pick!